STAMFORD, Conn.--(BUSINESS WIRE)--Starwood Hotels & Resorts Worldwide, Inc. (NYSE:HOT) today introduced Tribute Portfolio™, the company’s 10th brand and second collection of independent hotels. Promising owners, Starwood Preferred Guest® (SPG®) members and guests the ability to “Stay Independent,” the Tribute Portfolio brand will be comprised of outstanding independent hotels and resorts. With a firm focus on four star, upper upscale hotels, Tribute Portfolio will complement Starwood’s The Luxury Collection brand and further solidify Starwood as the world’s most global high-end hotel company. The brand will make its debut today with its first featured hotel, the iconic Royal Palm South Beach Miami and will soon open new hotels in Asheville, North Carolina, Nashville, Tennessee, Savannah, Georgia, and Charleston, South Carolina. Aron said Starwood’s goal is to have 100 Tribute Portfolio hotels and resorts over the next five years. Initial focus on growth of this new brand will be in North America and Europe, and travelers can expect to see Tribute Portfolio properties in global markets within the first year. Tribute Portfolio properties will be located in high-demand destinations and markets where SPG members travel but today Starwood has little or no footprint. According to a recent survey of SPG members conducted by Communispace in the SPG Advisory Community, 89% said they are interested in staying in independent hotels, particularly for leisure travel and special occasion trips to unique destinations. Additionally, nearly 70% of members said they have already stayed at an un-branded hotel property, representing a strong opportunity for the company. SPG members identified a diverse North American hotel wish-list that includes more Florida and Caribbean resorts as well as locations in California wine country, Las Vegas, and boutique markets like Savannah, Georgia, and Charleston, South Carolina. The list of “most wanted” global destinations features Alpine ski markets, African safari retreats, Southeast Asia resorts and Northern Europe, especially the Nordic countries. Demand is also on the rise for more hotels in South America, led by Rio, São Paulo and Buenos Aires as well as across Asia in primary markets such as Tokyo, Hong Kong, and Singapore. As with Starwood’s other nine brands, SPG members will be able to earn and redeem Starpoints® at Tribute Portfolio hotels and enjoy in-hotel elite tier benefits, such as upgrades, welcome amenities, late check-out and more. In celebration of Starwood’s 10th brand, SPG is offering members up to 10,000 bonus points for stays at Tribute Portfolio hotels through July 15, 2015. For more information and to register, visit www.spg.com/tributeportfolio. The Tribute Portfolio brand’s debut property, the iconic Royal Palm South Beach Miami, boasts direct beach access to world famous South Beach and is ideally located on Collins Avenue, steps from Ocean Drive and the area’s luxury retail shopping and entertainment district. 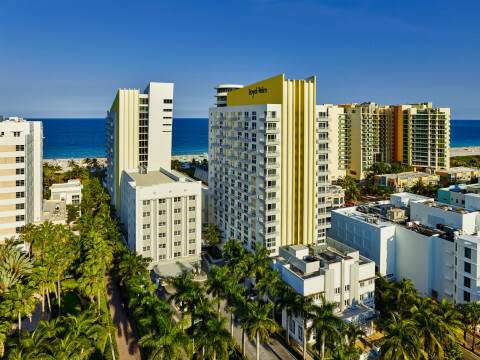 Owned by Chesapeake Lodging Trust and managed by HEI Hotels & Resorts, the Royal Palm South Beach, a Tribute Portfolio Resort, has been recently restored by Lauren Rottet of Rottet Studio as a modern homage to the hotel’s rich history. Dating back to 1939, the Royal Palm features 393 guestrooms, including more than 100 suites, two swimming pools surrounded by contemporary cabanas, a fully equipped gym, and more than 10,000 square feet of modern meeting and event space. Signature dining options include Florida Cookery Patio, an outdoor dining experience with approachable, local fare; South Shore bar and lounge, featuring a small plates menu and extensive cocktail list; and The Coffee Bar, providing all day coffee, juices, teas and pastries set in the hotel’s original green glass reception desk. A new destination restaurant, Byblos, will open this summer and feature Eastern Mediterranean fare by Executive Chef Stuart Cameron. Designed by Canadian design firm Munge Leung, this will be the first US outpost of the Toronto favorite. Tribute Portfolio also launches with four soon-to-open hotel properties. In Asheville, North Carolina, the well-known BB&T Bank building, which draws inspiration from renowned modernist architect Ludwig Mies van der Rohe, will open in 2017 as the Vandre Nouveau Hotel, a Tribute Portfolio Hotel. 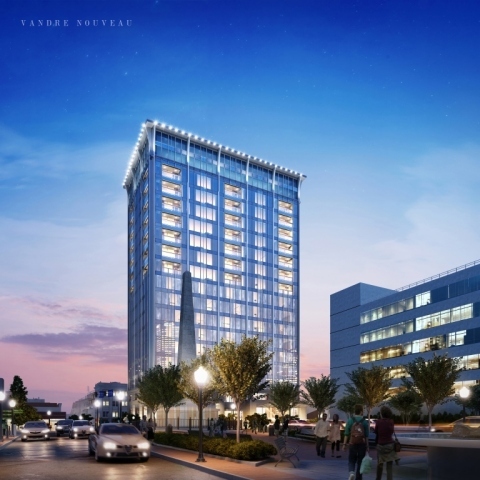 The property is a partnership between McKibbon Hotel Group and Tower Associates and will include 150 guest rooms and suites, a destination restaurant and lobby bar, and more than 4,000 square feet of modern meeting and event space. Starwood is also working with Rockbridge to open three Tribute Portfolio hotels. Debuting in 2016, the historically significant Noel Place Hotel in the Printers Alley area of downtown Nashville, Tennessee, will undergo a comprehensive renovation and feature 166 guestrooms and suites, a destination restaurant, rooftop bar and speakeasy. 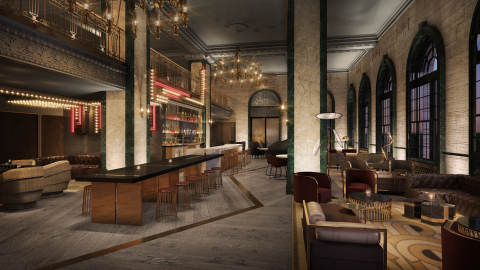 Also slated to open in 2016, a new build hotel in Savannah, Georgia, will be perfectly situated on River Street in the city’s Historic District and include 173 guestrooms and suites, an 11,000 square foot indoor/outdoor rooftop bar, outdoor swimming pool, and destination restaurant. In 2017, Tribute Portfolio will debut in the Historic District of Charleston, South Carolina, with a 100 guestroom hotel featuring a rooftop pool and bar, signature restaurant, and 11,000 square feet of indoor/outdoor meeting and event space. In connection with today’s Tribute Portfolio announcement, Starwood will run full-page advertisements that prominently feature the brand’s tagline of “Stay Independent” in the Wall Street Journal and USA Today, showcasing the first hotel to join the brand. Simultaneously, the company will launch an extensive global campaign to promote Tribute Portfolio in digital, social and traditional media channels, including advertising in both consumer and B2B print and digital outlets and event activations in key global markets. Starwood has also partnered with Instagram, the most engaged channel for SPG members, as one of the first brands to utilize the photo sharing platform’s new ad carousel format. As new hotels and resorts join the Tribute Portfolio brand, the campaign will continue to expand to further fuel excitement around the brand. Tribute Portfolio will also launch with a digital initiative that will zero in on extraordinary independent moments found at hotels throughout the brand. Dubbed #OurLikes, the campaign will celebrate the captivating features and experiences that travelers love about staying independent. Going beyond the typical hotel brochure, these socially sourced vignettes from guests will unveil the secret spots, must-sees and can’t miss experiences of Tribute Portfolio hotels, such as the dimly-lit Edison bulbs that lead the way to an underground whiskey bar, the off-the-menu cocktail with ingredients the bartender will never disclose, or the undiscovered corner of the rooftop lounge that offers an uninterrupted view of the sunset. “What makes Tribute Portfolio stand out is its simple focus on great independent hotels in exciting places that we know will absolutely delight our SPG members and guests,” concluded Marr. Follow along to Stay Independent. @TributePortfolio on Instagram, @TributePRTFLO on Twitter, www.tumblr.com/TributePortfolio, and www.facebook.com/TributePortfolio. For more information on Tribute Portfolio, please visit, www.tributeportfolio.com or www.youtube.com/user/tributeportfolio.